The Cape Vulture is endemic to South Africa. The adult has pale creamy-buff plumage, contrasting with the blackish-brown flight feathers and rectrices. There are dark brown centre patches on the greater wing coverts and the scapulars. The underparts are paler, pale cream on body and underwings. The flight feathers are paler than above, except the primaries which are blackish-brown, as the undertail feathers. The dark centre patches can be present on the underwing coverts, but they are sometimes absent. There is a white ruff at the neck base. The neck shows some sparse whitish down, and crown and nape are covered in white hairy feathers. The crop is dark brown. The bare shoulder patches are blue with reddish borders. Head and neck show bluish bare skin, turning bright purple when the bird is excited. The long, thin bill is horn-coloured with blackish cere. The eyes are reddish-brown. The bare legs and the long toes are black. The female has similar plumage but she is slightly larger than the male. The juvenile has slightly darker plumage overall. The neck is pinkish. The eyes are brown. It can breed between 6 and 9 years. The Cape Vulture, as other vultures, utters some noises such as cackling and hissing, but also grunts and roars. We can hear harsh grating calls around the carcasses. 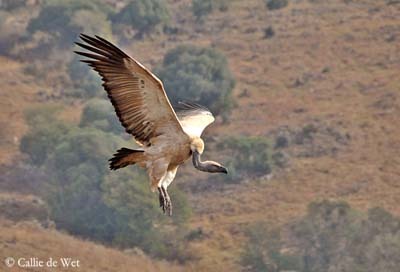 The Cape Vulture occurs near the mountains, in open grassland, arid savannahs and steppes. The mountains provide them the thermal currents necessary for the flight of these heavy birds. This species is less common in wooded areas. They breed and roost on cliffs. 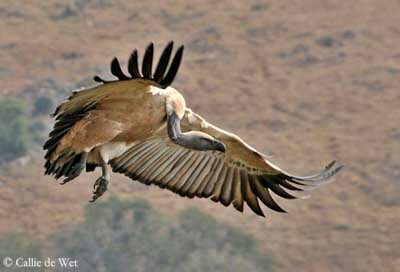 The Cape Vulture is found in South Africa, Lesotho, Botswana, northern Namibia and southern Zimbabwe. The Cape Vulture is a scavenger, feeding at large carcasses where it takes fragments of bones, soft muscles and organ tissues. They travel long distances in flocks while searching for food, and they can locate the carcasses thanks to their excellent eyesight. 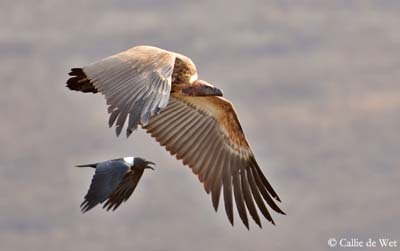 It often feeds with other vultures’ species. They fight against the other raptors to obtain food. The vultures insert the long bare neck under the skin or crawl into the carcass. They can be fairly numerous around the food, but there is a hierarchy. However, regular fights occur, with harsh, grating calls and threat displays with the wings outstretched or the neck and head held horizontally while they bound towards the rivals with great hops. The Cape Vulture regularly baths in pools after feeding. The bare skin of head and neck allows it to clean easily the blood of the carcass. Then, it remains in the sun with open wings. These birds are gregarious, feeding, roosting and breeding close to each other. The nesting colonies can hold up to 1000 pairs in cliffs. They can be seen from great distance, due to the sheets of white droppings below the nests. The Cape Vulture usually remains within the foraging range, travelling over about 100 km from nesting and roosting sites. The juveniles may disperse over larger distances, and form nursery areas outside the breeding colonies. 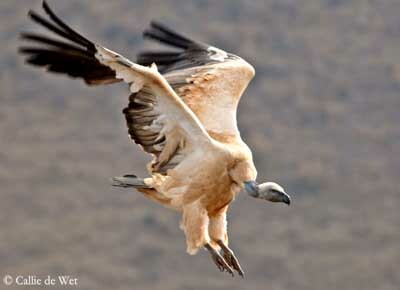 The Cape Vulture soars with its broad, long, rectangular wings in V-shape, upturned hand and spread tail. 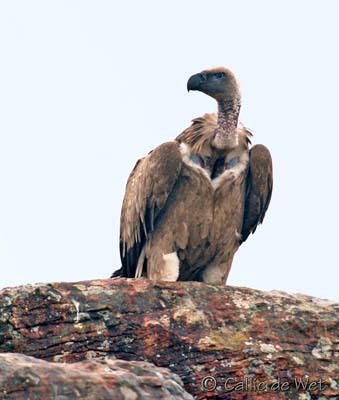 The vultures use the thermal currents near and in mountains, and rarely flap the wings. The breeding season occurs between April and July. The Cape Vulture breeds in large colonies on cliff faces. The nest is a platform made with sticks and lined with dry grass carried in the bill. Both sexes build the nest. The female lays a single egg. The incubation lasts about 55 days, shared by both adults. At hatching, the chick is covered in white down. The parents take turns, as well to incubate as to care the chick which is fed by regurgitation mouth-to-mouth. It fledges about 140 days after hatching. Unfortunately, very numerous chicks do not survive the first year of their life. 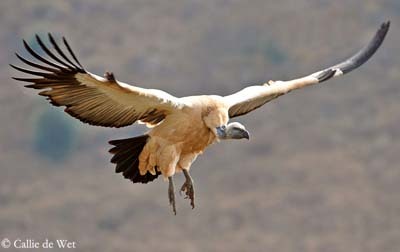 The Cape Vulture is a scavenger, feeding on carrion. Around the carcasses, it takes bone’s fragments, soft muscles and organ tissues. They soar in groups when searching for food, and can find the carcasses with their keen eyesight. The Cape Vulture is a rare species. They are threatened by the lack of food due to the changes in farm practices involving less livestock mortalities. Collisions with powerlines are also important threats. 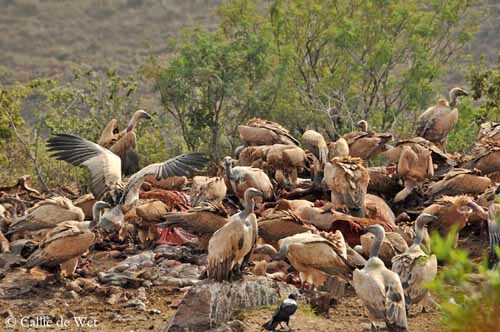 These vultures suffer poisoning and persecution, and are killed for traditional medicine, especially for their brain. The protection of the nesting colonies, the reduction of aerial powerlines and supplementary feeding are some of the conservation efforts always in progress. 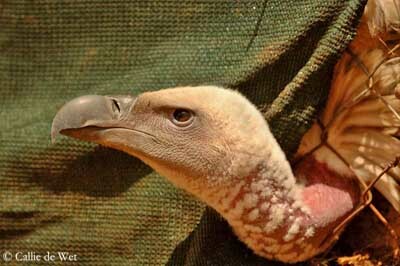 The Cape Vulture is listed as Vulnerable with a small population always in decline.